It’s easy to get caught up in the glamorous aspects of marketing – so easy, in fact, that you forget the small elements that really help to get you more bookings. Here are the 3 website elements that you should constantly tweak to boost your online booking conversion rate. These are your buttons which link to website pages. When your visitors land on your site, these buttons tell them what action to take, and what to expect once the button is clicked. Without them, all areas of your site would not be linked together seamlessly. Scroll through this article and see how many of ours you can find on just this one page! You also need to make sure that you have all different types of buttons that serve the needs of all types of visitors. Your visitor may be browsing for research, or they may be ready to buy from you. Do you have buttons that get them to where they want to go quickly? Just browsing: Have buttons for more information on each product. If you have several catalogs with various tour products, it would make sense to separate each catalog into a clickable button. For example, you can separate it by location or type of activity. Interested but want more information to feel comfortable: Have a button that links to a FAQs (frequently asked questions) page, photo gallery, or testimonial area from past customers. Also have your phone number or email address available so that they can call you or email you for specific enquiries if needed. Ready to buy: Your ‘Book Now’ button should be easily found and accessed from every page on your site. If they’re ready to book you have to make it simple for them to do so! Otherwise they may find it too difficult and select a competitor instead. You should also consider the colour of your call to action buttons, because they need to stand out. If they aren’t eye-catching, it will be difficult for visitors to find what they’re looking for. Obviously, you will want the ‘Book Now’ button to stand out the most. If your website provides a seamless experience where website visitors can find all the information they need and booking is facilitated easily, it can really boost your online booking conversion rate. Having forms on your website that cater to your customers’ needs is another way to be useful to them and boost your online booking conversion rate. How? You can add fields that help you by segmenting your database and helps them because they don’t have to leave your website to get what they want. Enquiry form. Keep this one short, just asking for contact details and an explanation of what they are after. Booking form. This is your chance to ask for all the information you need to make sure they have the best experience on their tour. Questions like dietary requirements are important and should be recorded and attached to your manifest. Again, we must stress that form length is important in improving your online booking conversion rate. How many times have you seen an intimidatingly lengthy form, thought ‘nope’ and clicked away? Make it as easy to fill out as possible by limiting questions to ones deemed necessary. When in doubt, people are hard-wired to look for signs of social proof from other people like themselves. The idea that others have gone through the path you are about to take – and they didn’t regret it – is needed to nudge you towards making that purchase. What kinds of social proof can you add to your website to prove that your tour or activity is totally worth it? Otherwise they may doubt the legitimacy of your business, seeing it as not well-established and amateurish. How good is your online booking conversion rate? You won’t be able to know how well you’re converting visitors into customers without having some way to track it online. If you make the small changes we’ve suggested above, you can test what is and isn’t working. With Rezdy, you can add your conversion tracking code to your booking form thank-you page. For example, you can enter your Google Conversion Tracking Code so you can measure the efficiency of your Adwords paid search campaigns. 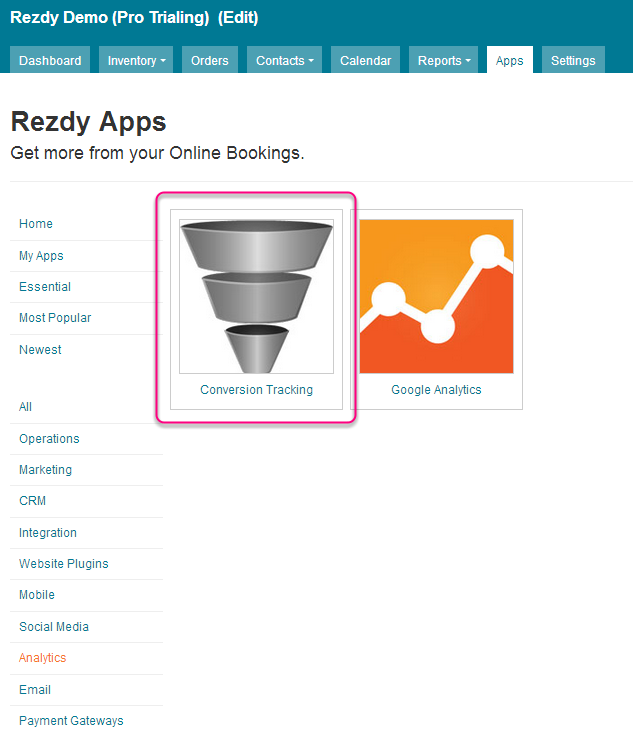 Your third party solution will now be able to track conversions through Rezdy. Think that sounds clever? There’s more than just that!